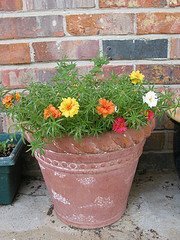 Me, too, i liked Portulaca -they're so easy to grow, and blooms lots in a variety of delightful colors! I had 2 green pots of Potulaca & gave it to one of my hubby's friends who helped us moved into a tiny loft. Luckily, i was able to rescue some seeds for my Mom. Oh, i missed them so much! 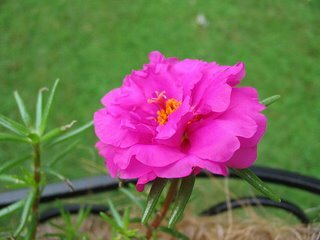 For some reason I can't get Moss Rose to grow in the ground here, but it does great in pots and hanging baskets. We also have a thicker stemmed kind called Flowering Purslane - descended from that weed in the vegetable garden! My portulaca failed miserably this year - will try again next. Just found your site and love it. Will be coming regularly. Let me know if you'd like to swap links. Have a good gardening weekend!